30 Second Wine Advisor: What's a negociant and why should we care?  What's a négociant and why should we care? Today let's review a fairly common French wine term that's not always widely understood and that can provide useful information in the quest for wine value. 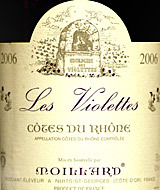  Moillard 2006 "Les Violettes" Côtes du Rhône ($10.99) Not overly complex, but this négociant Rhône is a nicely balanced food wine and a good value. What's a negociant and why should we care? What does a négociant negotiate? These French merchants (and their international counterparts) purchase grapes, juice or bulk wine from small farmers, which they then produce, bottle and market on a larger scale under the négociant's label. Some firms, particularly older and traditional businesses, will use the double-barreled term négociant-éleveur ("Neh-go-see-ahn Eh-leh-vuhr"), a couple of words that don't translate very well ("shipper-improver" might be a fair shot at it). In theory, a négociant simply buys, bottles and sells wine from outside sources, while an éleveur "improves" the wine by making it from grapes or freshly crushed juice. I've found, though, that the distinction is fuzzy in practice, and the terms are pretty much synonymous. Assuming savvy shopping, the result to the consumer can be wine of good value, if for no other reason than that négociant wines are generally more lightly regarded than the "estate-bottled" and "single-vineyard" wines made on the premises by producers who grow their own grapes. If you're willing to trade off the cachet (and the price) of estate-bottled wines and don't insist on top-rank style for everyday drinking, you'll find that négociant wines - particularly those from companies you've learned to trust - can offer a good, characteristic taste of a region and its grapes, without the expense of the more sought-after estate-bottled wines. Today's featured wine is a fine example. Browsing my neighborhood wine shop the other day, I spotted a modestly priced wine from Moillard, an estimable Burgundy producer from Nuits-St.-Georges. "Whoa," I emoted, startling a shopper in the next row. "A $10 Burgundy!" Well, not quite. As it turns out, Moillard is both a producer and a négociant. In this instance, the $10 wine was a fresh, young Côtes du Rhône, "bottled and shipped" by Moillard according to the English-language back label: A Burgundy producer assembling and exporting red Rhône wine with its négociant hat on. The Moillard Website, inscrutably describing the entire sprawling Côtes (hillsides) of the Northern and Southern Rhône as a "diversified vineyard [that] stretches from Vienne to Avignon," makes no claim to source the wines from any particular sub-region. It indicates that the wine may contain, in undisclosed proportions, the traditional Rhône blend of Grenache, Cinsault, Syrah, Carignan and Mourvèdre. In short, it's a standard négociant wine for sure, making no claim to being anything more special than a representative wine of its region. That said, Moillard makes fine Burgundies. And to my tasting (my notes are below), it makes a mighty tasty cheap Rhône. In recessionary times when many of us are looking for affordable wines of value and character, reliable négociants are important names to know. and add your comments and questions. You'll need to register with your real name, but it's easy and free, and then you'll be able to join in our online conversations. FOOD MATCH: It calls for red meat or grilled meat or poultry. It was particularly fine with burgers made with fresh local lamb with Middle Eastern spices, topped with dabs of Capriole Indiana goat cheese with basil. VALUE: In today's economy, an excellent value for $10; better still if you can find it discounted for less. WHEN TO DRINK: Historically, simple Côtes du Rhône has been considered a drink-me-now wine to be quaffed carelessly with bistro fare. With modern wine making, however, most good examples, even in the low-price range, can last for several years.